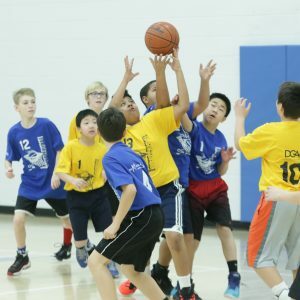 ​ Palatine Park District​ offers a Youth Basketball League​ for boys and girls in grades 3 through 8. The League emphasizes the fundamentals of the game, good sportsmanship, and teamwork while having fun through league play. Registration for the 2017-2018 Youth Basketball League will close on Sunday, October 1. Registration after the deadline does not guarantee placement on a team. Participants will be placed on a wait list and contacted after availability is confirmed. The goal of the league is to provide a fun, fair, and safe experience for all to enjoy. Each team is allotted one hour of practice each week and games are held on Saturdays at various scheduled times. Season will consist of 10 games. Rosters will be compiled starting October 2 and teams will begin practice the week of October 30. Games will be played from December 2, 2017 through March 10, 2018. Grade evaluations will be held at Palatine Park District Community Center, located at 250 E. Wood Street in Palatine. Evaluations are required for all players who are new to the league this season. Grade evaluation for boys in grades 3 through 8 will be held on September 25 and the evaluation for girls in grades 3 through 8 will be held on September 27. Registration for the Youth Basketball League is available in person at Birchwood Recreation Center, Community Center​, and Falcon Park Recreation Center​, as well as online at palatineparks.org​. The league fee is $147 for residents and $184 for non-residents. The District also offers a separate basketball league for first and second grades. This league will practice one evening a week for an hour and games will be played on Saturdays. Practices will begin the week of January 8 on Tuesday or Thursday, between 5:30-6:30pm or 6:30-7:30pm or Wednesday, 5:30-6:30pm at Falcon Park Recreation Center. The league fee is $90 for residents and $113 for non-residents. The 2017-2018 Youth Basketball League is sponsored by Chicagoland 4 Braces–Dr. Gerry Aylward, Chiggys Gyros​, Consumers Credit Union​, Culvers of Palatine​, DGAA Law LLC​, Photos Hotdogs​, and Prime Motorsports​. This season’s presenting sponsor is Orthodontic Experts​. For more information on basketball leagues and grade evaluations, visit our Athletic Leagues​ page or contact Basketball Coordinator Terry Nelson at 847.496.6277 or tnelson@palatineparks.org​.